801-787-1668. 2007 Cadillac Escalade ESV. 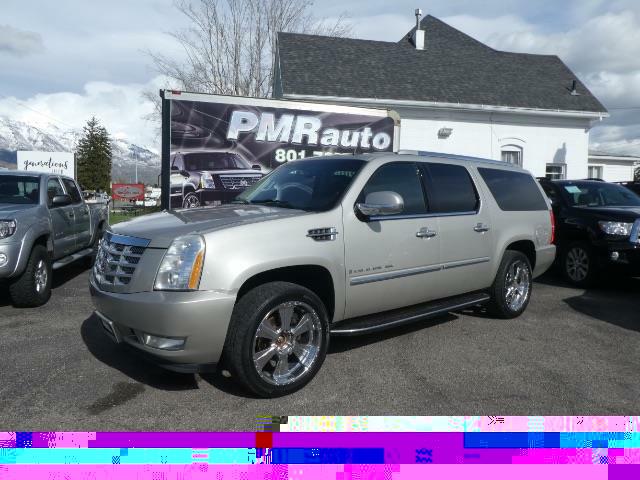 Loaded with Power sunroof, Navigation System, Rear back-up camera, AM/FM/CD player, 2nd and 3rd row DVD entertainment systems. Clean Title. Full Features Include: Leather, Air Conditioning w/ Dual Climate Control, Rear Air, , Power Steering, Power Windows, Power Door Locks, Dual Power Seats, Heated Seats, AM/FM Stereo, Multi Compact Disc, Bose Premium Sound, OnStar, Navigation System, DVD System (2), Moon Roof, ABS (4-Wheel), Traction Control, AutoRide Suspension, Dual Front Air Bags, Front Side Air Bags, Parking Sensors, Tilt Wheel, Cruise Control, Roof Rack, Privacy Glass, Towing Pkg, Running Boards The complete CARFAX vehicle history report is also available. Actually enjoy the car-buying experience and let us show you why so many of our customers recommend us to their Friends and Family. Price listed is INTERNET PRICE ONLY. Tell us you saw it on the Net. PMR Auto -- RIDE IN STYLE. Vehicle has a certified, clean & clear title. Prospective buyers are welcome to perform a pre-purchase mechanical inspection.